Twelve-year-old Riley McConnell lives in Charleston, South Carolina, with her parents and two sisters. Her favorite subject is math, and Riley hopes to become a doctor or scientist when she grows up. Earlier this year, one of Riley’s teachers gave the assignment to come up with an idea to help make the world a better place. The solution needed to have a long-lasting effect and address an environmental or social problem. Riley sold fatwood to raise money for Samaritan’s Purse. Fatwood has a high concentration of resin, which makes it burn well. Riley decided to focus on hunger. Riley was familiar with the work of Samaritan’s Purse, so she and her dad visited the website to look for ideas. She learned that Samaritan’s Purse animal projects help provide an ongoing source of food and income for needy families in places like Honduras, Niger, and Cambodia. 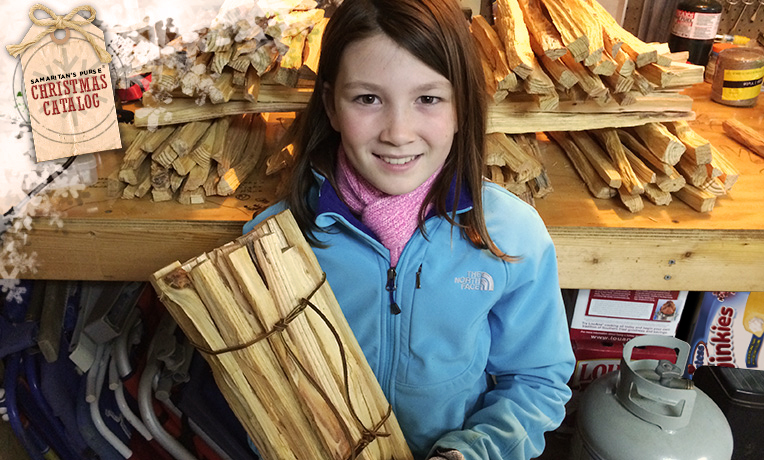 After Riley and her father cut the stumps and logs, she bundled it to sell door-to-door for $20. These animals can change a struggling family’s life. In addition to eating and selling chicken eggs and goat’s milk, the family can sell the offspring to earn money for things like school fees, medicine, and clothes. Riley decided to raise enough money to give one donkey, two goats, and 12 chickens through Samaritan’s Purse. After adding up the costs for each animal, she set her goal at $658. When it was time to present the idea to her classmates, Riley said she felt nervous. But she went ahead with her PowerPoint presentation, and at the end, she invited the class to donate to her project. 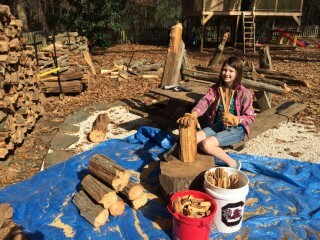 To help reach her goal, Riley (with her dad’s supervision) found stumps and logs in the woods, cut them into kindling sticks, and bundled them to sell door-to-door in her neighborhood. She also reached out to friends and family to ask if they’d like to donate. 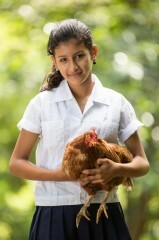 Riley’s gift will provide chickens like this one in Honduras to people in need. In just about four weeks, Riley collected $700—exceeding her target. She decided to use the extra money to give three additional chickens, bringing the total to 15. Riley’s success motivated her to keep doing similar projects. “I want to do this annually, and my hopes are that the whole entire world will be fed, and that it’s a better place with people not starving and kids getting fed,” she said. It also showed her that kids can make a big difference in the lives of other kids and their families. She offered encouragement for others to give it a try.